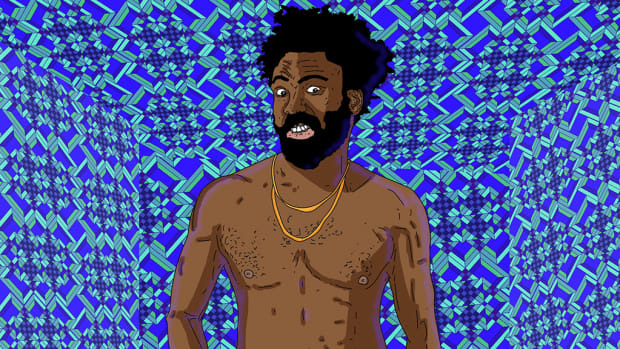 “Maybe it has to do with being older, but I just didn&apos;t want to do it anymore,” Donald Glover confessed to Slava Pastuk during a 2013 interview with Noisey. He was telling the former music editor of Vice about a recent incident at an ATM; how his presence while standing in the line caused noticeable nervousness from the white man who stood ahead of him. Deciding to step away and allow the gentleman to finish his transaction was a reminder of how his life was a cycle of adjusting for the comfort of others. Not just white people, but all people. “I don&apos;t want to make people comfortable all the time,” Glover concluded. In retrospect, the story could be the source for one of the most iconic quotes from the first season of FX’s Atlanta. To provide comfort is a choice. It’s a decision Glover consciously made at that ATM, in his life, and in his art. In the eyes of his audience, there was nothing dangerous or daring about Donald. He was the wunderkind writer who penned jokes for Tracy Morgan on 30 Rock; the naive yet lovable Troy Barnes from NBC’s Community; the nerdy post-808s & Heartbreak rapper, Childish Gambino. He was safe, selling comfortable art, destined to be in the lineage of Wayne Brady―a heavily hyphenated, innocuous, black entertainer. 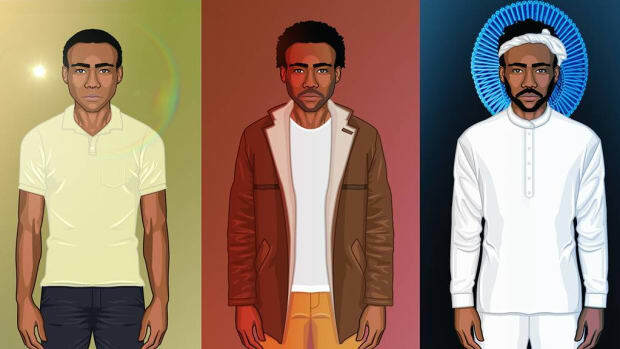 Between the two years of separation between his debut album, Camp, and sophomore LP, Because the Internet, Glover made a decision. He was done pandering. He was done being safe. 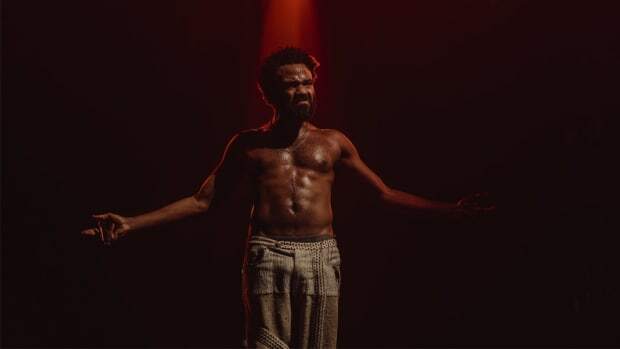 Saturday night, while hosting SNL, Childish Gambino did what he’s never done before: broke the internet. All our attention shifted toward “This Is America,” his first visual release since the 2015 music video for “Sober.” The explosive, four-minute mind-bender is brutal and chaotic, the very antithesis of peace. It&apos;s thoughtful and heavily symbolic—threads and think-pieces covering the video have maintained dominance over Twitter timelines and will migrate to Facebook in the coming weeks. “This Is America” received ovations for being a cultural tour de force, has been criticized heavily for its intense imagery, and has amassed over 38 million views in under three days amidst a surge of conversation, debate, and praise. In all the verbiage surrounding “This Is America,” you will not find the words "safe" or "comfortable." Ta-Nehisi Coates explained to Stephen Colbert in a 2017 interview how his job wasn’t to provide hope in the aftermath of Trump’s election about the future of race relations in America. Pastors are reinforcers of hope; friends and family provide shoulders of optimism to lean upon. Not Coates, not the artists who accept their role as truth-tellers. The truth shouldn’t function as solace for the soul, but rather the scorching branding of hot iron pressed against the skin. 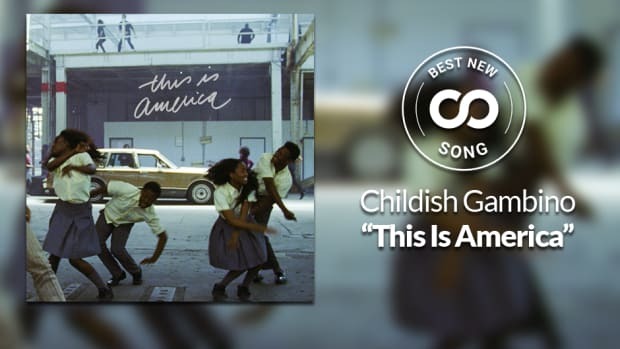 Childish Gambino’s “This Is America” is a descendant of that thinking, to tell the truth, and the truth is violent. There&apos;s comfort in the saccharine sound and simple sentiment. Illusions are comforting—they are the lies created to escape the truth. When Glover pulls his gun, strikes the Jim Crow-esque pose, and murders the innocent black guitar player execution-style, it&apos;s visually disturbing. The gunshot shatters the peace while the song is swallowed by aggressive bass and menacing percussion, and anarchic elements add to the feeling of sudden catastrophe. 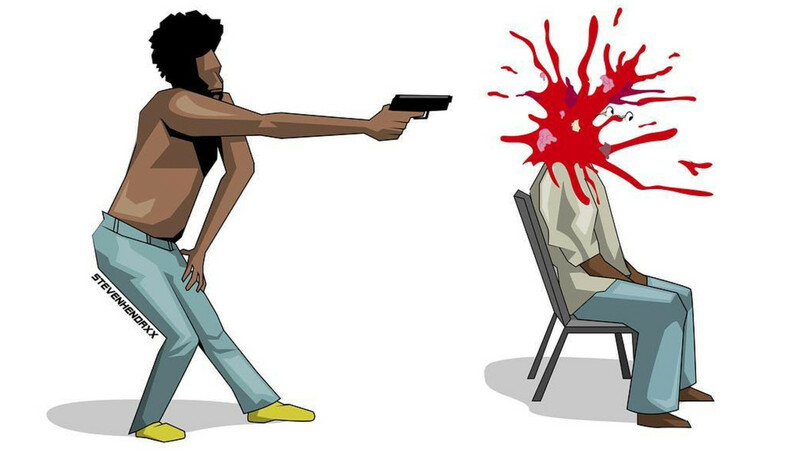 The illusion of peace isn’t the only mirage Glover was breaking with the first murder; by mimicking the Jim Crow pose and following with the execution he visually references a ceiling America created to restrict the growth and destroy the bodies of their black citizens. What was considered the Jim Crow laws dates back to the 19th century when Southern legislatures passed laws that affected racial segregation for blacks. The laws were created with the intent of maintaining white supremacy, and lynching was how the power of white terror was brutally reinforced. If the penitentiary is considered America’s modern replacement for slavery, the plundering of black bodies through gun violence is the successor to an old method from the old South. It also could be a nod to Thomas Rice, the slave-mimicking, blackface-wearing white man who became renowned for his performance of “Jumping Jim Crow.” Thomas stole the song and dance from slaves and was able to become a moderate sensation in the early 1830s. Glover brings forth memories of the past that show the long history of theft, mimicry, and murder associated with America and black identity. The children who remove Glover’s gun and dispose of the body appear to represent how grotesque acts of violence are commonplace, even to kids. Not because of movies, video games, or gangsta rap, but because it&apos;s in their classrooms, on their cellphones, and right outside their homes. There’s no innocence to be broken when guns are accessible, and murder is everywhere. By following the execution with a dance, Glover is showing us how black youth express joy in the midst of madness. Often it feels as if the only way black men and women go viral is through the latest dance craze or the latest recorded murder. You are likely to discover both without warning: One completely shatters your sense of peace and hope, while the other is a double dose of joy and enjoyment. You are one police encounter from being Eric Garner, or one viral video from Lil Meatball; black pain and black joy, both viewed by millions. Sherrie Silver is the choreographer behind the video, which features dance routines reminiscent of several Flying Lotus videos that used dance as a way of visualizing the acceptance of death. “Never Catch Me,” a video also directed by the brilliant Hiro Murai, does an excellent job of representing a child’s relationship with the curiosity that comes with dying young. The kids in “This Is America” seem to use dance as a resistance to their surroundings, a way of coping with their traumas, and a distraction to the viewers. It’s so easy to be enamored by the bodies in your forefront that you miss what’s happening in the background; when I first noticed the two chickens during the first verse it was only after viewing the video a dozen times, and I’m still uncertain what they represent. It’s also interesting to note that contrasting the black children dancing are the white people looting cars. They exist in the background, but the only actions that appear to be acted out by the white extras are looting and rioting. What comes with no distraction is the church choir massacre. Their singing is a brief but beautiful break from the madness. They aren’t singing of God, but for the black man to get his money. From this, two possible points can be derived: that the church is still a place of escape for black people and that the motivation to make money is always going to exist no matter the circumstances. In a society ruled by capitalism, the dollar is worshiped, sought after, and believed to be the almighty answer to all problems. To kill the choir members in cold blood with an automatic weapon is a questionable nod to Dylann Roof and the Charleston church terrorist attack. While there is understandable outrage over Glover&apos;s decision to display this imagery, especially as a black man re-enacting an act of white terror, I believe his intent was to show how even church isn’t safe. Not even your place of worship is immune to the brutal hatred manifested by racism, white supremacy, and fear. Dylann Roof is just the most recent example, but far from the first. The criticism surrounding the scene is reminiscent of NBC postponing the mass shooting episode of Jerrod Carmichael’s The Carmichael Show because it fell on the same day of two real-life mass shootings. In his criticism of NBC, Carmichael explained that the network&apos;s decision was a disservice to the public. We can debate whether Glover’s scene was shot in good taste, whether his message had a greater purpose than shock value, but what shouldn&apos;t be disregarded is the understanding that the imagery is inspired by real life. The feeling of being unsafe even in the church is based on the reality of everyday life. Even God doesn’t provide a safe haven from violent supremacy in America. The harsh truth is that nowhere is safe. “&apos;Theater of cruelty&apos; refers not just to the cruelty of life, but to cruelty inflicted on audience members to stir them out of their everyday torpor. As Artaud wrote, &apos;the images and movements employed will not be there solely for the external pleasure of eye or ear, but for that more secret and profitable one of the spirit.&apos;” —Sophie Gilbert, "Mother!&apos;s Theater of Cruelty"
For the second verse of “This Is America,” we enter a part of the warehouse that’s visually more disruptive than the first. Donald and children continue to dance, distracting our eyes, but the mayhem unfolding behind them is like a riot in a snow globe. There’s a lot to absorb―fighting, falling, the galloping arrival of Death. I wonder if placing the police behind Death displays how one arrives before the other. The scenes that follow took me back to the second half of Mother!, the extremely controversial and deeply analyzed film by Darren Aronofsky. Without giving away any spoilers, Mother! dares the viewer to question humanity&apos;s relationship with art, obsessive worship, and Mother Earth. It doesn’t do this with ease or grace, but through extreme absurdity within swirling madness. While partying, while dancing, while trying to find pleasure in your personal paradise, you can’t ignore the darkness. You can&apos;t ignore what America is. Glover&apos;s not allowing you to eat the pie without tasting the crust; to enjoy this black joy is to also confront the dread of black pain; to know this country&apos;s history is to know it&apos;s built upon stolen bodies, stolen culture, and merciless force. This is why making a mumble-esque post-To Pimp a Butterfly trap song filled with ad-libs from some of rap’s youngest trap stars makes sense. Trap speaks the minimal language of opulence, glory, and escapism. 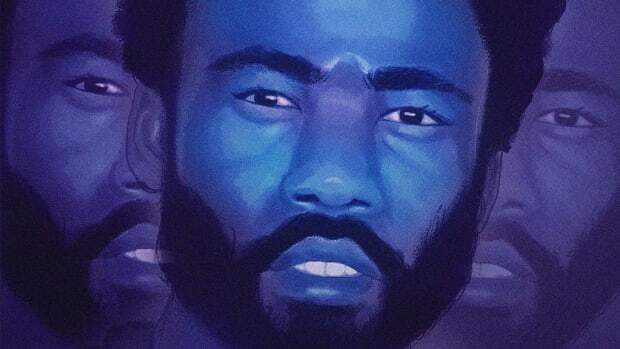 It’s rap rooted in making the best out of the bad, celebrating the capitalistic chase for freedom from poverty, but Donald uses the art form as a way of highlighting that all the stunting doesn’t resolve the risk. The song tells you to get your money, to enjoy the fruit of your labors, while the video reminds you that money doesn’t provide the privilege of escape. 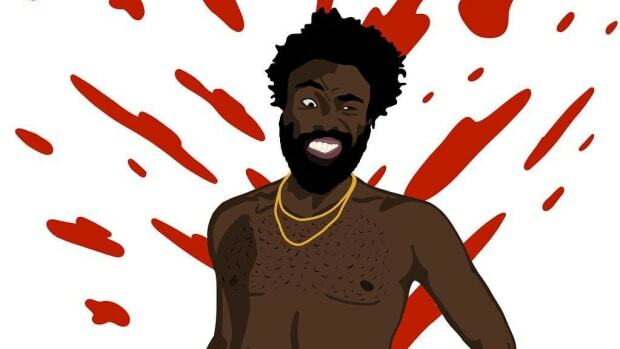 I’m not sure who Childish Gambino represents in all of this. At times, he seems to be the personification of American cruelty or some monster born from what he’s absorbed as the American way. There’s an end-of-the-world quality to “This Is America” as well; the anarchy and chaos do a great job at depicting a sense of lawless uprising. One thing is clear, though: Gambino, SZA, and the revived guitarist represents how in the end, there will always be music, dance, and the idea of beautiful liberty. The black American trinity of hope. 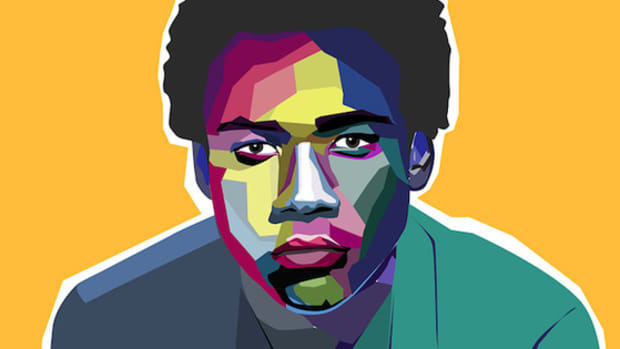 Dissecting Glover’s art tends to feel like a fool&apos;s errand. "Why?" isn’t a question he answers. Thinking back to the music video for “Telegraph Ave,” there’s no explanation for the alien transformation. He has yet to delve into the deeper meaning behind Clapping for the Wrong Reasons. Season one of FX’s Atlanta is filled with a plethora of unanswered questions. This approach of secrecy reminds me of the phrase "Roscoe’s Wetsuit." 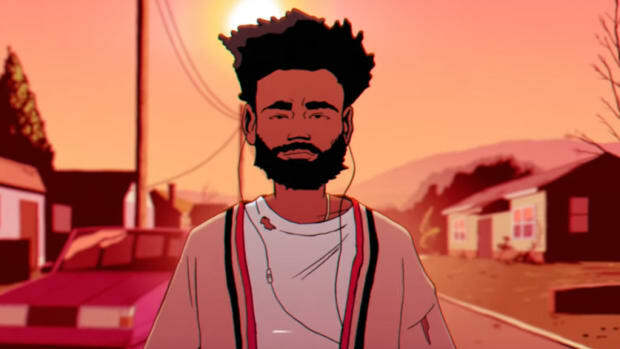 Throughout the script for Because the Internet, Roscoe’s Wetsuit is mentioned as a social media saying with no source to elucidate the meaning. The Boy asks again and again but never finds out the meaning. Roscoe’s Wetsuit is a metaphor for how Glover wants us to interact with his art, through interpretation and dialogue. Donald Glover wants us to have the conversation without guiding our way of thinking. His only job was to be the spark, tell the truth, and make us uncomfortable enough to have these discussions.